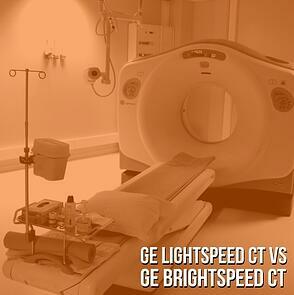 At first glance, GE Brightspeed and Lightspeed CT scanners are very similar. Remove just one decal, and the casual observer could easily mistake one for the other. However, though the hardware and basic structure are generally the same for both, there are some key differences you should know about if you’re considering purchasing a GE CT scanner from one of these series. Beyond these differences, it’s notable that Brightspeeds, though newer than Lightspeeds, are often presented with fewer standard options. It’s possible that the intent was to produce a more “budget-conscious” series of GE CT scanners but, given the scarcity of Brightspeeds on the secondary market, it’s not unusual for the price to actually be a bit higher than a Lightspeed. Similarly, you can expect to pay slightly more in service costs for a Brightspeed. Aside from their appearance, it would seem our “sister systems” are not so alike after all. But, where there’s variety, there’s opportunity to find a CT scanner that fits your unique needs and budget. If there are other differences we’ve failed to mention, let us know. We’re always happy to hear others’ experiences and preferences! Note: As you consider a CT scanner purchase, make sure you're aware of NEMA standard XR-29!